It didn't break through the coverage of the presidential election or the meltdown of our financial system, but corporate welfare was center stage at the Capitol last Friday. 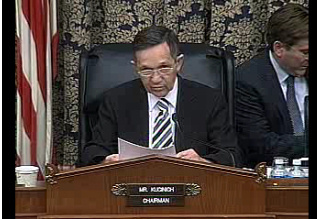 In his fourth Congressional hearing into the economic benefits - or lack thereof - of taxpayer-subsidized stadiums, Rep. Dennis Kucinich (D-Ohio) summoned to Washington the masterminds of America's most expensive stadium: the Yankees' new palace going up in the South Bronx. There was Randy Levine, President of the Yankees; Seth Pinksy, President of the New York City Economic Development Corporation; Martha Stark, Commissioner of the New York City Department of Finance defending the project. Also testifying was Assembly Member Richard Brodsky who as Chairman of the state's Assembly Committee on Corporations, Commissions and Authorities is conducting an investigation into the use of public financing for the project. If attendees (yours truly sat in) and web watchers (see www.fieldofschemes.com and www.atlanticyardsreport for the play by play) expected the hearing to clarify how the Yankees project - considered by many the murkiest deal in recent New York history - got a bundle of bond financing, they came away disappointed. It didn’t break through the presidential election or the meltdown of our financial system, but corporate welfare was back on trial at the Capitol last Friday. Can Slowdown in the Chicago Suburbs Lead to Smarter Growth? Chicago-area advocates of more sensible growth and land-use policies got a boost this week when Chicago Tribune columnist John McCarron urged the region’s public officials to see one upside of the painful economic crisis: a chance to put the region’s “suburban sprawl machine” into reverse. 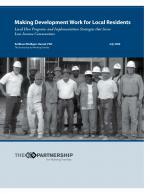 Community benefits agreements are changing the power dynamics of local economic development in many parts of the country. Will Chicago’s Budget Crisis Finally Curb TIF? Chicago city government faces a two-year deficit of at least $469 million, with additional massive shortfalls looming through 2012.